My husband found this double-hearted leaf yesterday and brought it to me. It had fallen from a tree and was laying, unappreciated, in the grass until then. The leaf’s hearts are delicate, and easily torn and ruined without care and love. And sadly, by this morning, it was starting to dry up and wither apart from its tree, the vine, the branch which gave it life. Love is like that. We need each other to be tender, nurturing and caring in order to live and thrive and grow properly. We need to appreciate each other and not let others just lay around unseen. We need desperately to be hooked up to our life source, Jesus, who gives us abundant life beyond imagining. This entry was posted in Christianity, Faith, Family, Life, Love, Uncategorized and tagged family, Jesus, Leaf, Love, Marriage, Nature, tree by lyonsroarforgod. Bookmark the permalink. 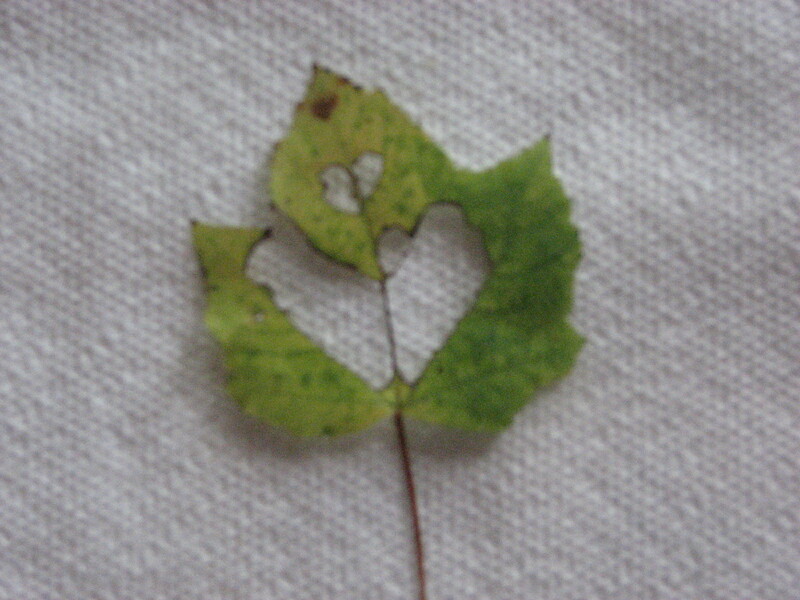 Two hearts in one leaf….how amzing!! What a beautiful analogy you gave us to think about today by comparing the leaf’s withering by this morning without the proper nurturing it received when attached to the vine, just like the love we have for God and each other can wither if it is not properly cared for and nourished. Thank you, Lisa, for the wonderful inspiration! You are welcome…these kind of things, sweet little leaves, help me so much to see God, and how He has such care over all things. How He is so creative and even the leaves have beauty. Pretty cool. 🙂 Hope your Monday is flowing smoothly so far! Beautiful put right to the point. I always loves people who see the miracle and the beauty in the smallest of things. How many people would walk right over that and miss it? With God, we are definitely 2 hearts that beat as one!